This version of the well known Delectable Mountains quilt block will be a challenge for those wanting to move on to more complicated blocks. Although technically this block is an eight patch, it will not be constructed in a row by row fashion, but rather as an uneven nine patch -- because I just find that easier to manage. The block is not difficult, but there are many pieces -- 101 in fact, so as long as you can sew an accurate quarter inch seam allowance you can make this block. 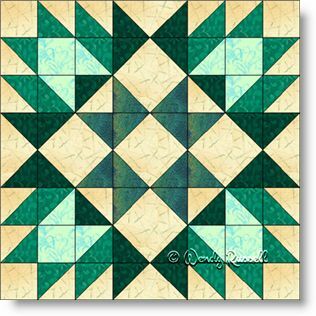 You will get lots of practice making half square triangles and then will also construct a few flying geese and square in a square patches. The two sample quilts illustrated use a standard side by side block setting and also an on point layout of the blocks.